Anadyr Adventures offers exciting Alaska day tours out of Valdez, Alaska for all ages and skill levels. Seakayaking is the premier Alaska Day Tour. Join Anadyr Adventures naturalist guides as they expertly lead you by kayak in the shadow of towering mountains, pristine fjiords, majestic waterfalls, imposing icebergs and active glaciers. No experience is necessary. We paddle and hike an average of 6 hours with frequent stops for wildlife watching, photography, lunch and onshore activities. We are a company that prides ourselves on the experience, on what we see rather than how many miles we paddle. Our maximum guide to client ratio is 1:8. Trip dates are from May 15th to September 20th except where noted below. Valdez Glacier, in Alaska’s Chugach Mountains, was the first major obstacle for gold rushers taking the All American route to the Dawson City gold fields. That’s if you don’t count coming from Seattle to Valdez in a fish freighter whose owners pounced on the opportunity to fill their holds with suckers heading north for the gold fields after emptying them of then longer fresh different kettle of fish they’d shipped south from Cordova, Alaska, just a little bit south of Valdez. It might have been the only all American route but you could probably count the number of folks who made it to Dawson on your fingers. And that’s how Anadyr Adventures Valdez Glacier kayak trip began. A nice little historical tour retracing a small portion of the least successful gold field route of the entire Alaskan Gold Rush. And then we discovered the ice. Ice in the lake. Icebergs coming off the glacier and slowly melting into spectacular forms. Caves, cliffs, flooded crevasses. Ice still part of the glacier and being shaped by the water running on and through the glacier. Sometimes, the tour is mostly a kayak trip. Sometimes there’s hikling on the glacier and less kayaking. The glacier changes through the seasons and through the years and you realize that using the word “glacial” to mean very slow is a flagrant misuse of English. We’re out there pretty much every day from the time the lake thaws until late September. We can’t guarantee you will go in ice caves. We can’t guarantee you will hike on the glacier The trip’s goal is to explore the best of what can be safely explored at any given time and we can guarantee our best in fulfilling that goal. And by the way, we still do a bit of history along the way. Our experienced and knowledgeable guides will conduct interpretive glaciology discussions as well as share some tales of the early miners and fortune seekers who traversed the glacier during the Valdez Gold Rush of 1889. No experience is necessary. We provide expert guides and all the gear necessary to safely explore the glacier. Dress in layers, bring comfortable hiking shoes, rain gear, lunch, water, and a camera. Departure dates are daily June 1 to Sep 20. For dates prior to June 1 inquire with us. The largest tidewater glacier in Prince William Sound and the second largest in the entire state of Alaska, Columbia Glacier is 25 miles from Valdez and covers more than 400 square miles. The face is more than 3 miles wide and is rapidly moving backward at a rate of 4 feet per day in the summer! Enjoy an hour boat ride to the glacier, then kayak amid towering icebergs, gliding through bays that are completely inaccessible by motorized boats, and observe sea otters and harbor seals hauled out on the ice floes. Keep a close lookout for sea lions, bears and, quite often, whales! Hike on recently uncovered landscape and in the adjacent old growth forest. This trip was pioneered by Anadyr Adventures. THIS TRIP REQUIRES PADDLING EXPERIENCE. Take a scenic two hour motor boat ride to the face of Columbia Glacier where you will have the unique opportunity to paddle around icebergs at the face of the fastest receding glacier in North America. Explore some of the newest landscape in the Sound in this magnificent glacial fjord. Paddling around this amphitheater of ice is sure to be a highlight of your trip to Alaska. Ice in the bay can be very thick and impossible to predict so there is a chance that your boat will not be able to make it to the face, in which case you would do the Columbia Glacier Iceberg Tour instead of the face trip. This trip was pioneered by Anadyr Adventures in 2017. A great choice for getting up close to the face of a glacier, Shoup Glacier sits right at the edge of tidewater. The face and the ice formations along the lateral moraines are those of a glacier deciding what it will become. Abundant with sea-life, marine birds, ducks, sea otters and harbor seals, Shoup Bay has the fastest growing Kittiwake rookery in Prince William Sound with more than 20,000 birds and 6,000 nests. Great for hiking, kayaking near icebergs, and observing harbor seals hauled out on ice floes, Shoup Bay is the ideal trip for beginning kayakers and kids. Join Anadyr Adventures for an awe inspiring day of sea-kayaking along the rugged southern coast of Glacier Island. Situated at the mouth of Columbia Bay (home of Columbia Glacier, Prince William Sound’s largest tidewater glacier), Glacier Island offers the opportunity to paddle alongside abrupt and dramatic shoreline usually indicative of lands exposed directly to the open ocean, while staying within the sheltered waters of Prince William Sound. We’ll explore towering sea-caves, visit with tufted and horned puffins and Stellar Sea Lions, and have a good chance of seeing Orcas and Humpbacks. Due to the semi-exposed nature of this trip, it is weather dependent, with a Columbia or Shoup Glacier day trip as an alternative option. So, come along for an experience of a lifetime paddling with us in a very special place in Prince William Sound. Unique geology and geography combine with intense winter weather and amazing wildlife, to make Glacier Island truly a gem among jewels. Join our naturalist guides in a sea kayak tour from the Small Boat Harbor into the waters of Port Valdez. Your guide will relate information about the town’s unique past, from its early Gold Rush days to the devastation of Old Town Valdez destroyed in the 1964 Earthquake. 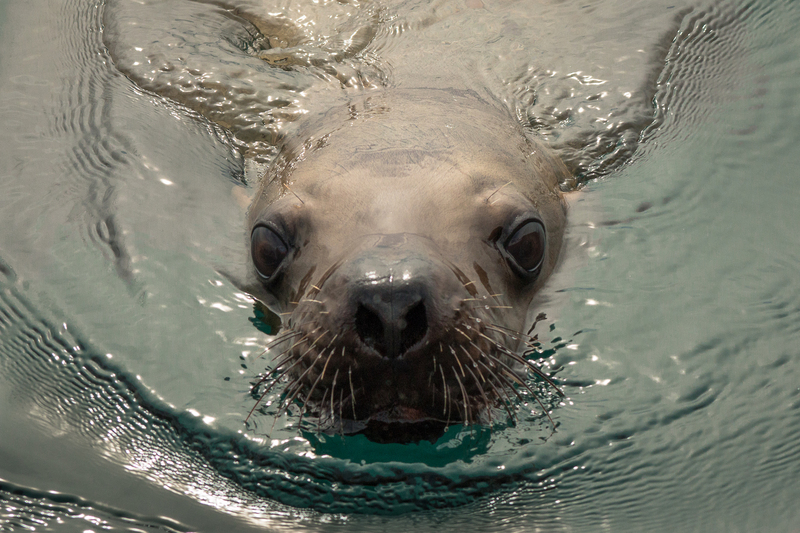 Wildlife highlights on the trip include up-close encounters with curious sea lions, shy harbor seals, sea otters and marine birds. This tour is ideal for travelers with limited time in Valdez, cruise ship passengers and children of all ages. May be available on a non reservation basis prior to May 15th depending on weather. We invite you to paddle with us along the shoreline of Port Valdez to Gold Creek. A favorite recreational destination for local kayakers. Gold Creek nature tour gives you numerous opportunities for observing shorebirds, marine mammals, waterfalls and intertideal organisms. Hiking, beach-combing, berry picking and kayak fishing are all possible additional activities for the day. Probably our most strenuous trip, Gold Creek is for moderately experienced paddlers. Surrounded by towering mountains, waterfalls and salmon streams, Sawmill Bay is well protected from wind and sea and is the ideal spot for the novice kayaker’s first day on the water. Kayaking, hiking, berry picking, salmon fishing and wildlife watching are just some of the activities possible in this uniquely beautiful bay. Examine the complex salmon based ecosystem of coastal Alaska. During the spawning season (mid June-September), we paddle up stream with thousands of salmon as they return to their natal streams to reproduce and expire. Black bears and bald eagles frequent the shorelines to feast on nature’s bounty, as do a variety of birds and sea mammals. This trip was pioneered by Anadyr Adventures. Get together with a group of friends or family for a sea kayaking and hiking adventure. Enjoy paddling together while we take care of the details! Contact us well in advance of your departure date and we will happy to work with you to develop a customized day tour itinerary suited to your interests.